← I wore Birkenstocks in Paris — quelle horreur! Maybe I’m just now starting to pay attention, but lately I’ve been noticing cider offerings on cocktail menus. Not apple cider — hard cider. I think it’s a thing. One of my friends from the West Coast is a cider girl — she loves the stuff — and Vancouver Island is where I visited my first cider house, Sea Cider Farm & Ciderhouse. But Calgary has always struck me as a firmly-entrenched beer city, so it’s refreshing to see ciders sneaking their way into more bars. And now, into my home. A new arrival on the cider-scene is Savanna Dry, a cider from South Africa that’s made from the fermented juice of crushed Elgin apples (Elgin is a region on the country’s Western Cape). 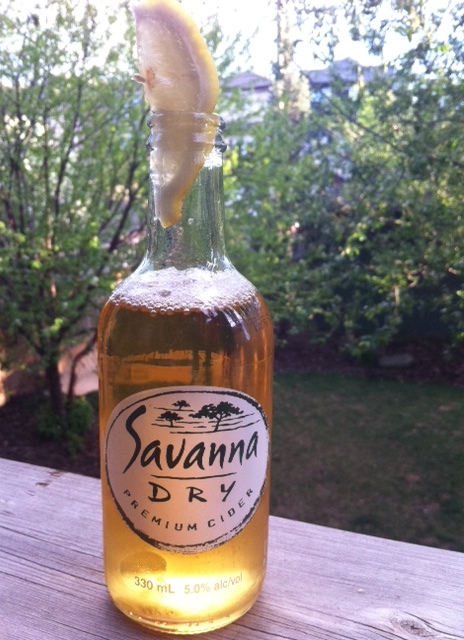 Savanna Dry is not as sweet as a traditional cider (hence the “dry”), which I really like for summer sipping. Another selling point is it’s GMO- and gluten-free. This dry cider from South Africa really is better with a lemon wedge. Savanna Dry comes in a stubby bottle and you’re supposed to drink it with a lemon wedge, a la Grasshopper or other wheat ale. I tried it first without the lemon and then with it squeezed in, and I have to say I much preferred it after the citrus was added. Kind of like how a lime turns Corona from weak pee-pee into an elixir you can drink all day poolside or at the beach. Not that this cider tastes weak on its own — it’s like a crisp, light, dry white wine — but the citrus just elevates it thanks to the tartness, and also lends it a certain beer guzzle-ability factor. I’ve always thought of ciders as a sort of white wine-beer hybrid and this one proves me right. You can alternate between sipping and chugging. Really. This entry was posted in Cocktails and tagged can you add lemons to Savanna Dry, cider, cider popular, hard cider, Savanna Dry, Savanna Dry Premium Cider. Bookmark the permalink.